Any good Admin from time to time has to roll-up their sleeves and do some work with the Apex Data Loader (or LexiLoader if you’re using a Mac). It’s the "go to" data utility for mass uploading, updating and deleting records – but did you know you can also use it to mass upload attachments? If you’re maintaining an existing org it might never come up, but when you’re merging Salesforce orgs or have a client that wants existing attachments moved into a new Salesforce instance it’s a cool trick! If you are merging orgs, it’s probably best to do a Weekly Data Export to efficiently grab all the existing attachments. When doing so, make sure you select the option to include attachments. 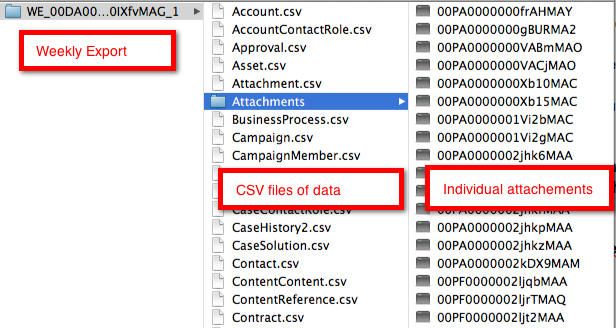 The Data Export will give you a starting file (Attachments.csv) that you can modify to create your import file as well as put all your existing attachments in one directory. Body – this where you tell the Data Loader where to get the actual file that will be imported. It should be the directory on your computer down to the file name. I started with the directory on my computer that held my Data Export, "/Users/shell/Desktop/WeeklyExport Backup/WE_00DA0000000IXfvMAG_1/Attachments/" and then I appended the file ID "00PA0000000gBURMA2″ that was in the "ID" column of my Attachments.csv from my Data Export. ParentID – the Salesforce record ID that you would like the attachment associated with (e.g. the Lead, Account, Contact, Opportunity, etc). 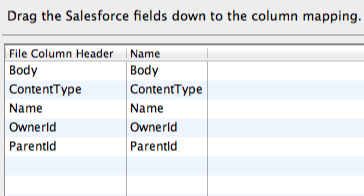 There is one knowledge article hiding out in Salesforce help that is a good primer – search for "How do I import attachments using my Data Export files?"